This song, a live rendition of God Rest Ye Merry Gentlemen by David Bazan with the first part of his song Harmless Sparks, has captivated me this Christmas. David Bazan is a prophet in most senses of the word. There is something about that last section that has resonated with me all this month as I struggle through my beliefs of Jesus, consumerism and culture. I spent a total of 25 minutes or so in stores to get a few items to put Rachel’s present together, and that was enough to get me irritated at what Christmas has turned into. At theStory this year we set up installations all around the space to inspire different reactions toward the season. Some were positive and others were negative. 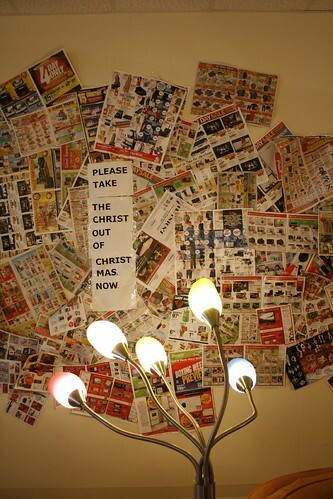 My favourite one was a wall splattered with Christmas store flyers with the message “Please take the Christ out of Christmas Now” on it taken from this post by Stupid Church People. We did have the whole post up there, but we thought it would be more poignant for just the one line. Joe did a post here with all the installations at Thinker Labs. I’ve tried to respond properly through the last few weeks. In the end, Christmas day was great this year. Spent time with my family, taught them Settlers of Catan, and ate great food. Rachel and I made each other the exact same Christmas gift as each other without knowing it two years in a row. Our family Christmas with Rachel’s side of the family is going to be on Saturday so I’m looking forward to all the great things, games, food and family. I could do this every Christmas over and over again, and just include more and more people all day long, I can’t get enough of it. The more Christmas’ I can have that are filled with those things, I think the more I’ll be able to cheer up a bit more during this season. It reminds me that there is still good in this world, and that there is hope. It reminds me of Jesus and that he came into a messed up world of greed, selfishness, murder and still loved us. Our Puritan ancestors, following the lead of Oliver Cromwell, stopped celebrating Christmas because it had become too filled with revelry and otherwise worldly distractions. It wouldn’t be such a bad idea for us to adopt. I suspect, though, there are ways to “keep Christmas” without giving into such excess. There really are two questions here that I see. #1 How do I guard my own heart? I wonder if Christ came back today as he did all those years ago, how many of us would recognize Him? How much of my religious observances and celebrations are so watered down from the truth and power they should have? #2 How do I impact my world beginning at home? Do I reject the Christmas celebration altogether, or do I begin with what is common and use that as a stepping stone to exploring truth with someone else? I also struggle too with the fact that the early church remebrances and celebrations probably centred more around Christ’s death and resurrection. I haven’t looked into it, but I wonder, would they even celebrate Christmas at all in the early church. glad to see another bazan fan, he truly is a modern day prophet. just saw him live on the 15th, great show. we used that song at church last week too.